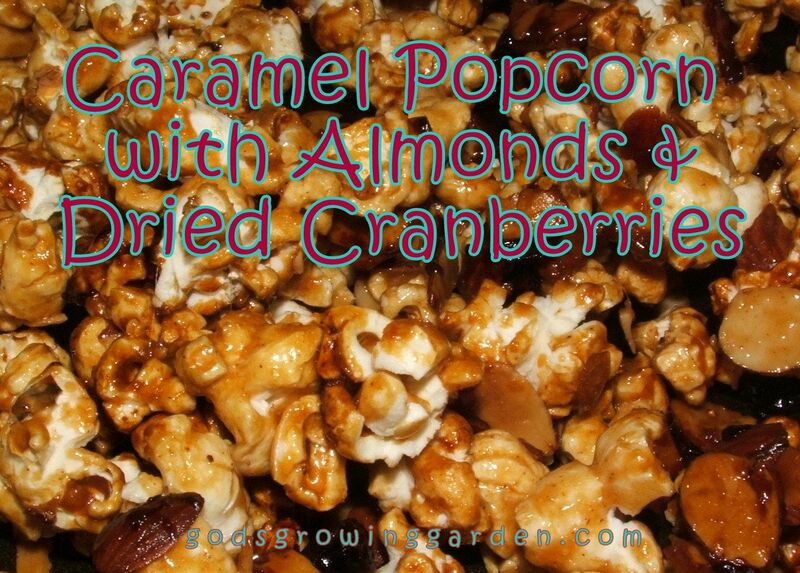 This is a tasty twist on the regular caramel-corn - I have added some cinnamon, almonds & dried cranberries!! First step is to pop your plain popcorn (use a hot-air popper or pop in a heavy kettle on the stove - I would not suggest using microwave popcorn because of the oils used give it a funky flavor - not to mention how unhealthy they are for you). 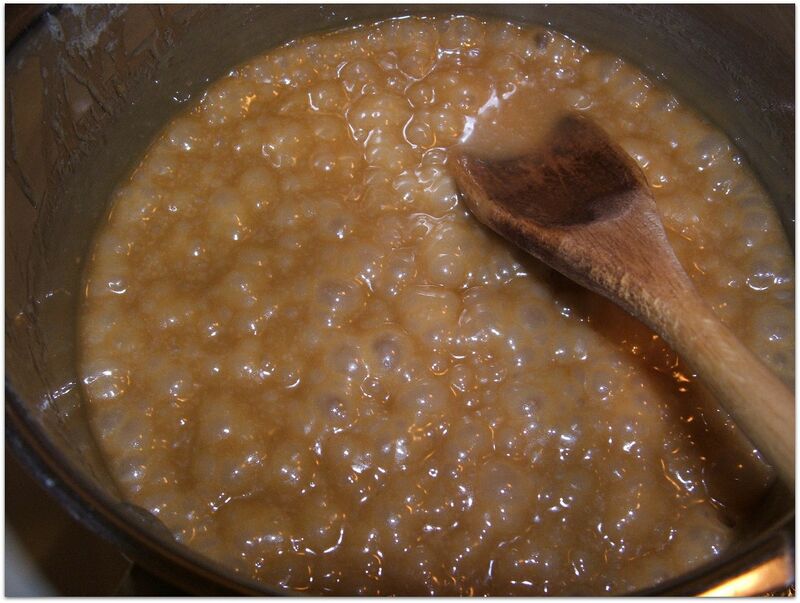 In a medium saucepan bring the butter, sugar & corn syrup to a low boil for 3 to 5 minutes (stirring all the time). 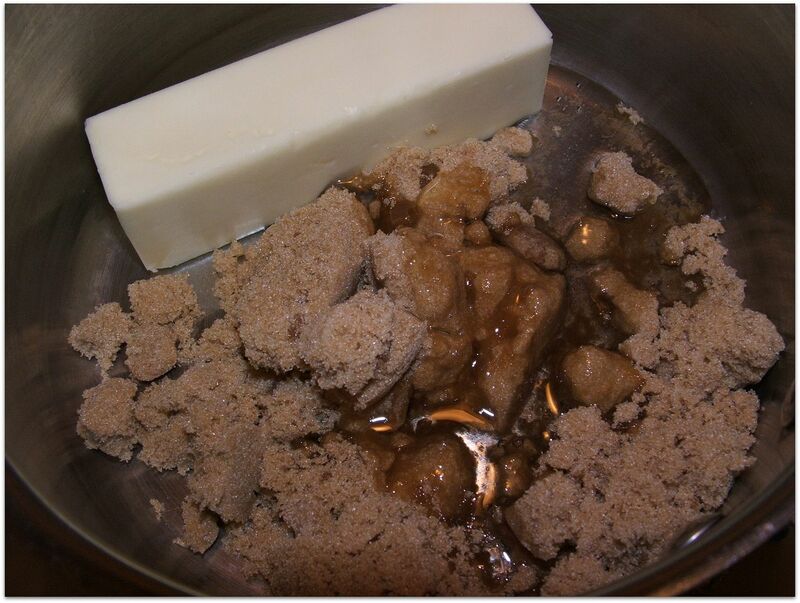 Remove the pan from the heat and add in the vanilla, baking soda & cinnamon - mix well & you will notice it bubble up - keep on stirring (see picture on the right below). 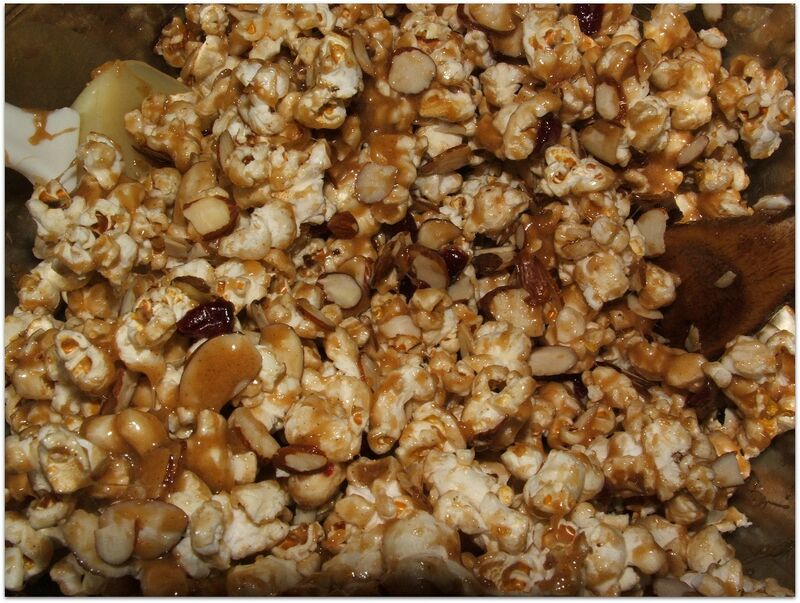 In a large mixing bowl stir together the plain popcorn & the almonds. 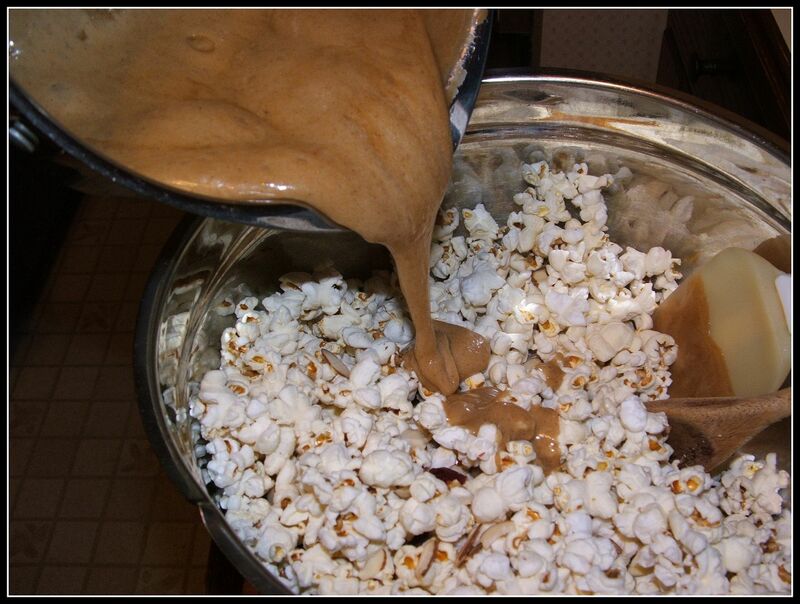 Now pour the hot caramel liquid over the popcorn/almond mixture & stir until almost everything is covered with the buttery caramel (see next 2 pictures below). 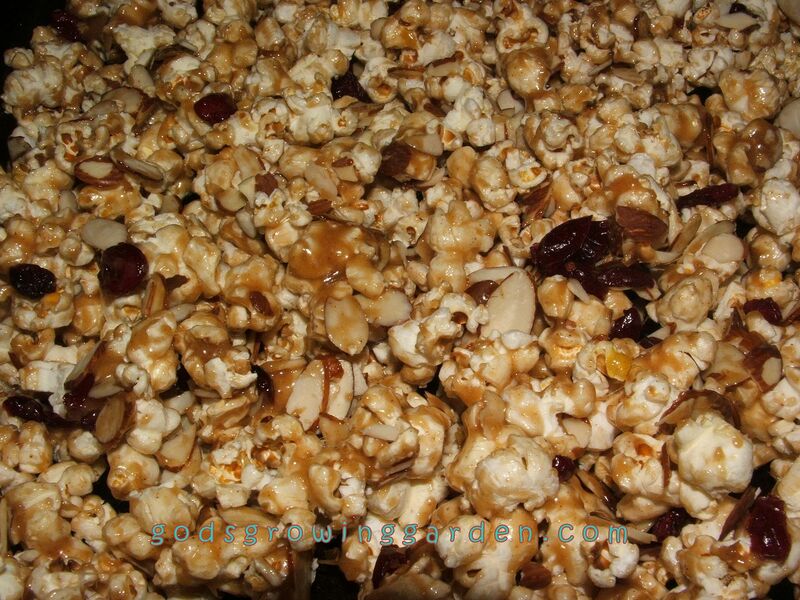 Spread the caramel covered popcorn & almonds onto a cookie sheet (spray the cookie sheet first). Bake in a preheated 300 degree oven for 12 minutes - remove from the oven & stir the corn around a little and add the dried cranberries. Return to the oven and bake for another 5 minutes. NOTE - if you add the cranberries at the beginning they will become as hard as a pebble! Allow to cool & serve! 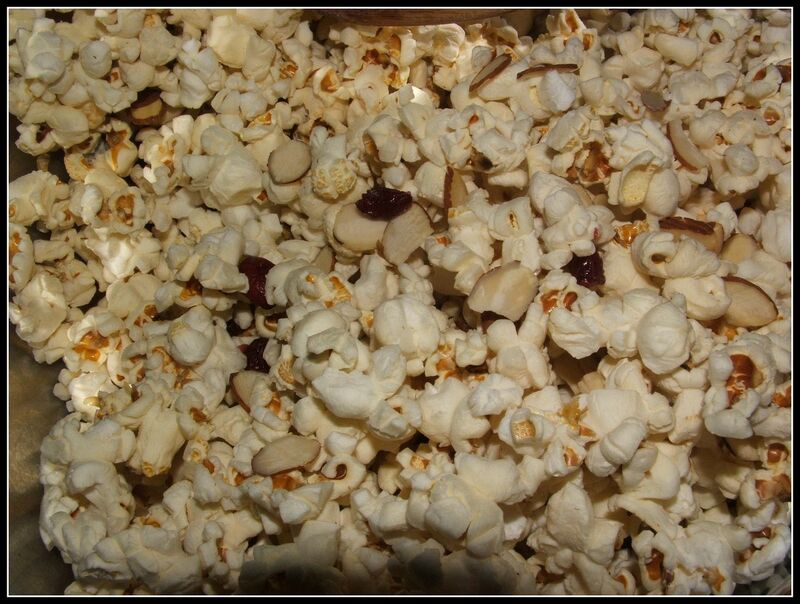 IMPORTANT - Never leave the kitchen when the popcorn is in the oven!! - Perfectly delicious Caramel corn is literally only 30 seconds away from becoming Burned Dentist's Goldmine Corn! 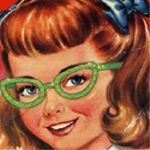 Heidi has such a fun blog and a great sense of humor! This is how she describes herself & her blog: "Quirky, eccentric, silly, yes these are all words that have been used to describe me. I have three cats who run my life. Really they do! Just read their guest posts on Sundays. I also love vintage clothes, accessories, okay, pretty much anything old. You can see some of the items I love in my etsy shop Real Gone Cat Clothes"
This looks delicious! I might just have to try it tonight! thanks! I found you on Serenity You! These looks so delicious! I bet the smell amazing! My kids love caramel popcorn! I didn't know it was this easy to make. Thanks for sharing! Dropping by from Wake Up Wednesday. have a great week! Girl this looks so good. I love that you added the almonds. I love them covered in caramel.